With 4 wins and 6 draws, and 3 more rounds to go, Wesley So leads the pack of this 14-man tournament at the end of Round 10 of Tata Steel Masters 2017 by a full point. At the end of Round 10, So leads by 1 full point at 7 points. 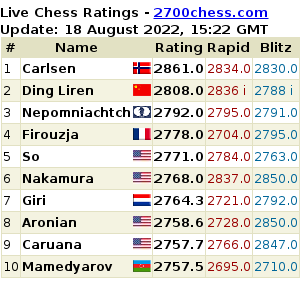 Five players: Levon Aronian, Magnus Carlsen, Sergey Karjakin, Pavel Eljanov, and Wei Yi, share second place at 6 points. Replay all the games played in Tata Steel Masters 2017. I was right all along. Our kabayan now potentially possess the talent and skill 4 a 2860 rating. Mabuhay ka. Can you stare at him eye to eye Prospero Pichay? Glad to see you waging the Philippine flag rather than the Stars and Stripes wesley. We are proud of you!!! So what. It is not an honor for the Philippines. C pechay ang nag.support nya. Go Posporo Pechay! Wesley it’s your time to shine!! !